Oswin Benjamin. Five Fingers Of Death. The scene of the crime: Sway In The Morning. What crime? MICROPHONE MURDER!! Watch! Oswin Benjamin Goes off on ‘Sway In The Morning’ with a 10-minute and 9-beat freestyle. A dude from Marvel did the artwork??? Wow! Here’s a word from the wise, and if you’re hip you’ll take the tip. 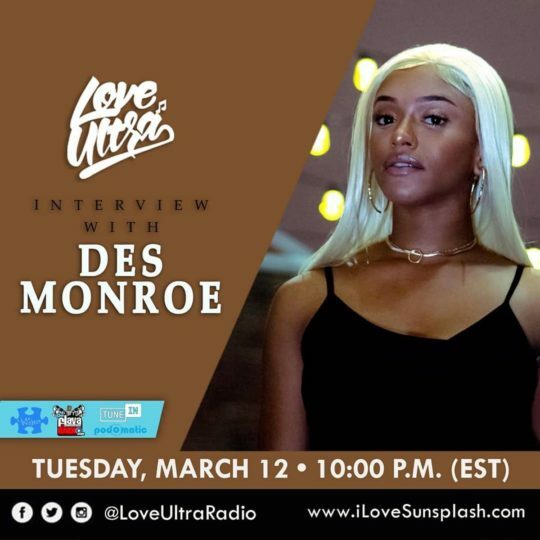 Iman Lexington (yeah, she is wise, and THE PLUG) shared that (1) Love Ultra Radio is back on the ILoveSunsplash.com platform again TONIGHT (2) with special guest Des Monroe. You know, Des with her debut project “Twenty” out on Tidal and a bunch of other streaming spots. The First Lady of Xth Power… that Des Monroe. The 2019 Takeoff ATL Urban Music Awards nominee for Best Female R&B Performance, Project/EP Of The Year, and R&B Female Artist Of The Year… that Des Monroe. If you are still not knowing. LEARN! Tune in to the homie Jah Prince by clicking the Listen Live option and choosing ‘DaFlavaRadio1’ at ILoveSunsplash.com. You can even dial 712-432-8479 on any phone and listen live. You CANNOT miss this. You don’t even need a radio to jam to the radio tonight! Live mixing, good chat, engaging host, hot guest, and I.Lex gave it her bless… Yep, I know where I’ll be at 10pm (Eastern). In fact, I’ll be there jamming EARLY. Join me! HYENAAAAAAS! Barz and a dope interview from one of the Mass Appeal Starting 5, Ezri. Plus Joe Waters is on to wreck, too! Whoa! Ezri was on ‘Empire’ too? Nice. De La Soul has done the work but is not getting ALL the bag. Well, Industry Rule #4080 is still a thing, but less so today, right? Weeeeell… here they tell Sway that Tommy Boy Records is still in the way 30+ years later. Tsk, tsk, tsk. Watch as the Plugs and Sway speak on that and more. Wow! It has been 15 or so years that Pap’s been bubbling, hasn’t it? Been respecting him for hanging in with Remy, now let this interview remind you why the artist and the work should be respected. Period.